Information submitted by a loving daughter, Peggy Lee Zink, April 1998. 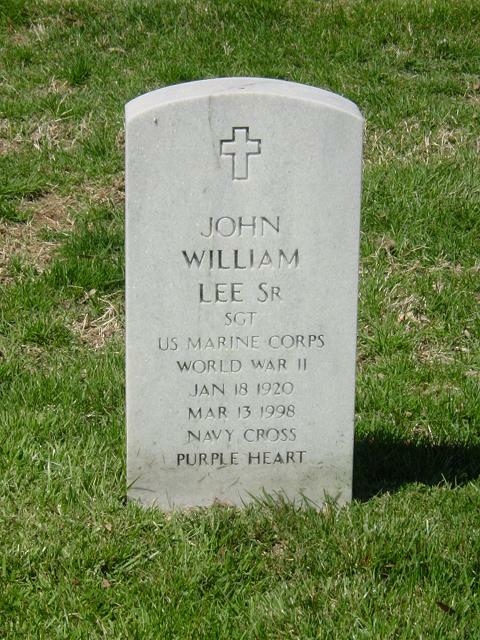 John W. Lee, Sr. was born January 18, 1920 in Bay City, Michigan, where he lived his entire life. He served as a Sergeant in the 1st Marine division, 1st tank battalion in World War II. His bloodiest battles were fought in the south pacific; Soloman Islands, Guadalcanal, Peleliu etc. He started on the U.S.S. Wakefield, May, 17, 1942. While on Peleliu in 1944, serving as a tank gunner, his 1st tank battalion could not advance because of a Japanese minefield that was covered by high velosity weapons and mortors. Taking the initiative, Lee left his tank and began guiding the platoon through the area. While guiding the platoon, the lead tank hit an enemy mine and it sent him flying through the air causing internal injuries. He refused to remain hospitalised and returned to active duty shortly thereafter. He was awarded the Purple Heart, but more importantly he received the Navy Cross, the United States Navy's second highest award for valor, for his bravery. In his citation, the Navy wrote: "His splendid intuition, daring aggressiveness, and personal valor were in keeping with the highest traditions of the United States Naval Service". He also received Asiatic Pacific Award with five stars. John W. Lee, Sr., was a Metallurgist at Prestolite where he worked his entire adult life until his retirement. John died March 13, 1998. He was a Marine to the very end. His cremains will be buried in Arlington National Cemetery May, 29, 1998. God bless and Semper Fi, John. He is survived by his wife of 53 years, Ida. He is also survived by six children, 11 grand children, one sister and one brother. The Navy Cross is presented to John W. Lee, Sergeant, U.S. Marine Corps (Reserve), for extraordinary heroism while serving as a Tank Gunner in a platoon of Company A, First Tank Battalion, First Marine Division, in action against enemy Japanese forces on Peleliu, Palau Islands, from 15 to 30 September 1944. When the advance of his tank platoon was halted by a mine field covered by Japanese high velocity weapons and mortars, Sergeant Lee left his tank and proceeded to guide the platoon through the area. Although wounded by an explosion when the lead tank hit an enemy mine, he courageously administered first aid to other wounded personnel and disarmed the damaged tank before consenting to evacuation. Voluntarily reporting to duty after a short period, Sergeant Lee, on 30 September, again left his vehicle upon discovering several enemy personnel in a by-passed cave and, undaunted by hostile fire, courageously covered the Japanese-held cave while he directed his comrades in placing explosive charges to seal up the hostile emplacement. By his initiative, gallant courage and devotion to duty throughout, Sergeant Lee upheld the highest traditions of the United States Naval Service.